U-boats sink seven neutral ships. 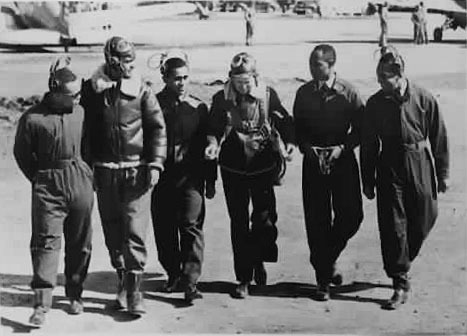 US 99th Pursuit Squadron activated, the first black unit in the Army Air Corps. Grand Coulee Dam opens in Washington state, the world’s largest source of electric power. Late in the afternoon after an unsuccessful Italian torpedo-aircraft attack, Admiral Iachino’s squadron engages the British convoy. The convoy protected itself with a smokescreen, but the cruiser HMS Cleopatra was damaged. Admiral Philip Vian, commanding the British escorts, sent his destroyers to torpedo attack the Italian battleship Littorio. Getting dark and so Admiral Iachino turned away from the British convoy and sailed for home. A Polish newspaper editor is beheaded for listening to the BBC, as German terror continues in Poland. Britain agrees to allow US to deliver emergency flour supply to Vichy France. British statesman Sir Stanford Cripps tries to persuade Gandhi to encourage India to help war effort. Newly built gas chamber/crematory IV opens at Auschwitz. Nazis extend work week in Netherlands to 54 hours. 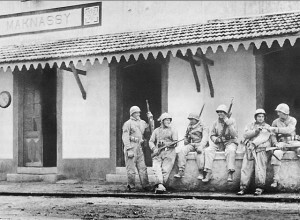 Patton’s forces occupy Maknassy, Tunisia. British tanks rout a Japanese tank force at Tamu in India. New Zealanders make final failed assault on Monte Cassino, Italy. In US, “A” gas rationing cards cut from 3 gallons/wk to 2 gal/wk. The U.S. First Army’s bridgehead at Remagen is now 30 miles long. General George Patton’s US Third Army crosses Rhine at Nierstein & Oppenheim at night, surprising the Germans. US Eighth Army secures Panay in the Philippines.